I thought an Epiphany was a good thing. I recently had an Epiphany, and it wasn't. I have come to realise that I live with Fear. I am fearful. Alot of the time. Except I do. Feel afraid. Or, maybe, it is Fear's less needy but similarly neurotic cousin, Worry? Worry seems better. More socially acceptable. Less victim-y. 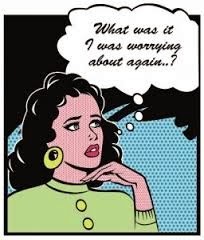 Yeah, let's go with Worry. I WORRY about the People I Love getting hurt, or sick. Proper Sick, I mean. Flaky skin or diarrhoea, I am brave in the face of. I WORRY about Me getting Proper Sick, but only because I WORRY about the People I Love coping with it. I WORRY about getting stuff wrong as a Parent. I WORRY I (or Someone I Love) will do something wrong, accidentally, or piss the wrong person off & find myself in jail - I concede that this must be a unique concern for those of us living where we live. I WORRY I am not achieving what I could/should with my horse or my writing. I WORRY that I am delusional about both of the Above. I WORRY that my house smells too doggy. The number of unlistened-to podcasts on my iPod is building up. This worries me. I WORRY that my time being able to help The Boy with his homework is running out. That I may have hit my intellectual peak in his Year 1. I WORRY that he is too gentle and caring - and, perversely, that he might lose those lovely traits of his. Avocados worry me. I love avocados but I find the responsibility immense. You must commit when you purchase an avocado. You must commit to feeling you WILL want to eat it in 48 hours. Not in 56 hours, not in the next 24 hours. It will be ready in 48 hours, that is when It will be ready, no sooner, and that, is when you must eat it. Regardless. For, after that it will have suddenly gone too far & your window of opportunity, will be gone. Forever. I WORRY too about difficult conversations with the Boy about adoption - about getting it wrong & screwing up the chance to help him find the least painful path through his feelings, questions & worsecase scenario, making it even harder. I FRET about Stupid Strangers saying stupid things to him, in front of him. Be warned, I might punch you, Stupid Stranger. There's more. I WORRY about when it's the right time to turn on the AC. We all seem in denial that Summer comes every year &, giving in and going Full A/C feels like admitting defeat, that Winter is done & we are prepared to accept the 40+ degree Lifestyle for another year. And finally, (not really, but I have to draw the line somewhere) do I drink enough water? I do love you, my faraway, extra-special, darling, daring, stranger-punching friend.